by Jake Maines on November 28, 2018 . We work with a lot of clients who have dumped money into online advertising on platforms like Google and Facebook. They may even get good click-through-rates (CTR) and cost per click (CPC), but they don’t see actual leads coming through. We find that more often than not, landing pages are the missing component keeping their ads from closing the deal. So you’ve decided who to target. Your copy and imagery are set up. Now, there are a few key things to consider before leads will start pouring in. The main consideration (which I’m sure you guessed from the title of the article) is where to send the people who are clicking on your ad. A majority of advertisers will take the easy route and drop in the URL of their website’s homepage or some generic related page. This technique will result in clicks, but will ultimately be a waste of money when your new website visitors don’t convert into leads. 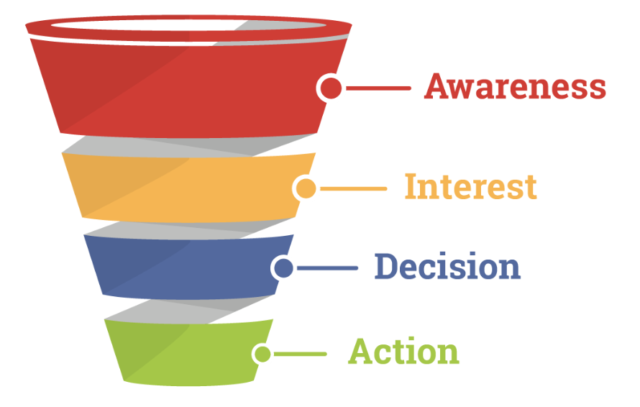 Your advertising strategy does not end with a click and the reality is the click on your ad is only a very small portion of the entire funnel. A landing page is a dedicated page on your site where you are directing traffic, typically through paid advertising strategies. The primary goal of a landing page is to maximize the percentage of people who convert into a lead or sale after clicking on an ad. Ready to convert your clicks into leads? Follow the techniques below and build an effective landing page for your advertisements. People may click on your ad for any number of reasons – curiosity, entertainment, value, etc. What you need to do is identify the core reason your ideal customer is likely to click on your ad. This is one of the most critical elements of your landing page because the place you take your clickers needs to meet or exceed the expectation that caused them to click. If they land on some generic page that includes a broad variety of topics, you are missing an opportunity to direct their attention to the most valuable offer or content you could connect them with. So make sure your landing page is consistent in two ways: content and design. Make sure your content is consistent. If you bait them with a great offer, make it as easy as possible for them to get the offer. If you promise to help them with something, immediately present them with something that will meet that specific need. Know exactly why someone would click on your ad, and connect them with what they were hoping to see when they clicked. Also, make sure your landing page and ad are visually consistent with your brand. No curious clicker wants to feel uncertain of the ad they clicked on. Give them a consistent, comfortable experience with your colors, style, and typography. Like in all advertising copy, quality is far more valuable than quantity. Both in your ads and your landing pages, only include what is genuinely valuable and communicates your value as quickly as possible. As for your landing pages, we recommend skimming-friendly elements like bullet points to outline value or 1-3 sentence testimonial from someone your prospect would likely relate to. Also, get creative with your style! People (including you) hear sales-y talk all the time. Stand out and connect with your audience by talking like a human – pretend you were describing your offer to a friend! Whatever you’re offering, don’t let your prospect get distracted by less important things. Don’t link out to your social media or to other pages on your website that are unrelated to your offer. Ideally, you want them to have two options, take action or leave. Now, you might be concerned that a seemingly “all or nothing” approach may cost you some customers who need more warming up. We encourage you to experiment with your own ads and get to know your own following! In our experience (and those of many industry experts), you want your page to be dedicated to closing the deal, not giving a runaround. Whatever you do, make sure you have a clear call to action. Your ad will be useless if your traffic doesn’t have a clear idea of what value they’ll be getting. So maybe you’re not a web designer and the thought of building a dedicated landing page for every ad sounds like a nightmare. We get that! For our clients who are only doing advertising with us (instead of full website support as well), we utilize a tool called Leadpages. Leadpages is a drag-and-drop landing page builder that helps you make attractive, custom landing pages in no time. Check it out! Would it help if you had another set of eyes take a look at your current strategy? Let’s chat! We love doing digital marketing reviews. We can take a look at your current strategy together, and help you identify actionable gaps and improvement areas to boost your marketing performance. If that sounds like something that would help you, let’s connect!